Fenugreek has magical medicinal benefits,not only as a beauty aid for good skin and hair,keeping dandruff,acne and dryness of hair &skin at bay,but also reduces cholesterol and blood sugar levels,and has been used for the treatment of various ailments like heartburn,diarrhoea,fevers,etc from the ancient times.Both the leaves and seeds of this slightly bitter-tasting wonderful vegetable are widely used in traditional Indian cooking&thought that it definitely deserved to be talked about 🙂 Fenugreek seeds are also traditionally used to enhance milk production in lactating mothers especially in India.Studies have indicated that the production of milk can increase by up to 500% within 1-3 days of consuming fenugreek seeds regularly as it contains Diosgenin -a compound having estrogen like properties. Even today a yummy fenugreek based sweet is a must for lactating mothers in South India!!! 1. Clean, wash & soak rice, methi, urad dal for 4 hours together. 2. Grind with coconut milk and beaten rice (cleaned & washed )to a very fine paste. 3. Add yeast and mix the batter. 4. Keep it for fermentation for about 4 to 5 hrs in a warm place. 5. 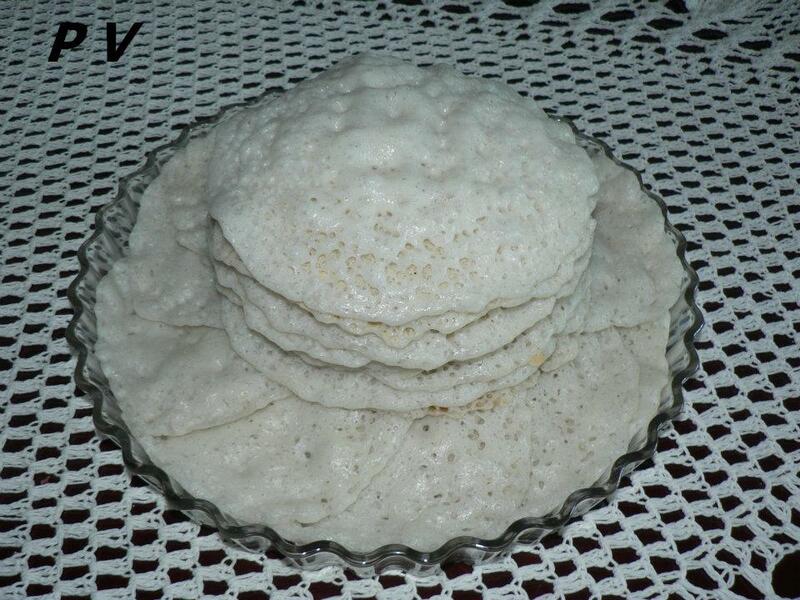 Then prepare dosa with non stick tawa or aapam pan without oil. Clean, wash and pressure cook methi seeds in plenty of water till soft. Strain and remove water. Grind methi to a rough paste. Fry the ground methi paste in 1/2 kg ghee until the ghee separates and oozes out. Add jaggery and boil till thick and sticky syrup. Add coconut, beaten rice and mix well. Remove, cool and store. 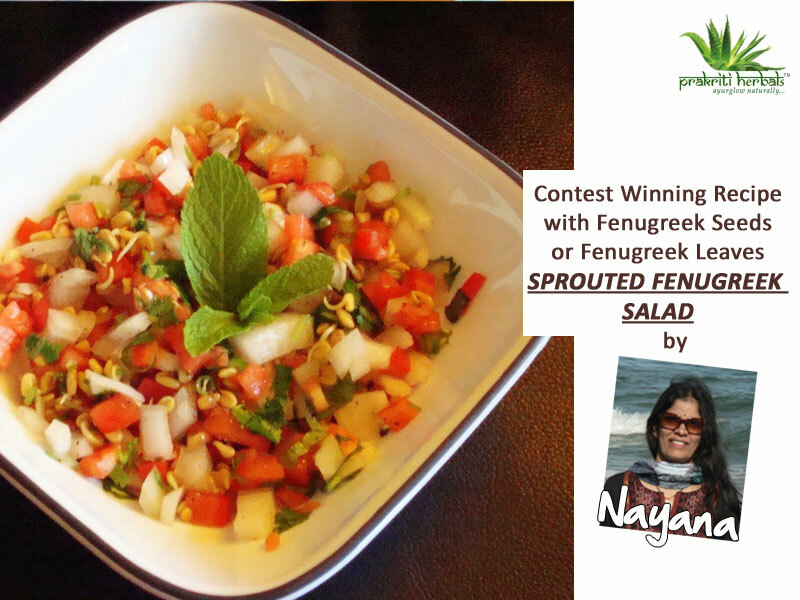 You would also be interested in the contest winning recipes of our healthy fenugreek recipe contest and how fenugreek helps reduce dandruff,dryness and hair loss naturally!!! 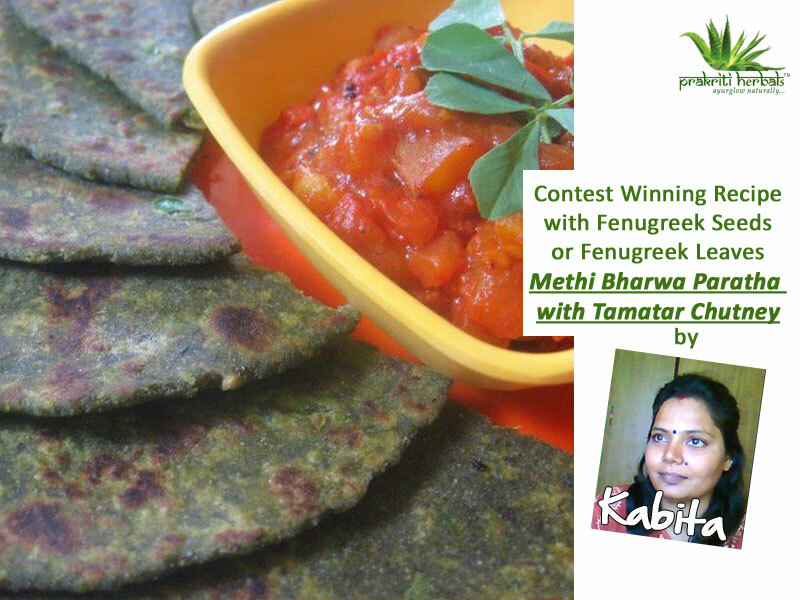 Contest winners of Our Healthy Fenugreek Recipe Contest!!! FENUGREEK-Nature’s boon for all round health is truly a blessing not only for our skin,hair but also for optimum health. Fenugreek or “methi ” as it is called in India not only reduces dandruff,hair fall and acne,but also lowers cholesterol ,diabetes and is a natural remedy for many other ailments. 1.Boil one liter of water and take it out of the flame. Clean and wash the (fenugreek) methi leaves and add it to the boiling water (This process takes out the bitterness of methi while keeping its nutritional values intact and gives it more color and texture). Cover and let it be for 5 minute. Now drain the water and add garlic, chilly, dry mango powder and salt to the methi leaves and grind them into a fine paste. Pour the paste onto a bowl and add the multigrain flour to it till it makes fine dough and keep it aside. Try to avoid water. 2.Now heat a non stick pan and add one teaspoon of olive oil. Before it catches more heat add the chopped garlic and chilly (to preserve Olive oil’s nutritional values don’t let it release smoke when heated). Sauté it little and add the crushed green peas and salt. fry it on low flame for 7-8 minute. Once done let it cool. 3.Make medium sized ball from the methi dough and stuff it with the crushed peas and roll it to a chapati size. Heat a non stick tawa and fry the parantha with olive oil. Note that to avoid use of more oil it is advisable to use a brush to apply oil on the parantha. It keeps them soft and melting yet uses less amount of oil. 1. Soak methi seeds overnight. 2. Drain the water, wrap the seeds in a cloth and keep in a closed container for 1 or 2 days till sprouts appear. 3. Repeat Steps 1 and 2 for moong seeds. 4. Chop all the fruits and vegetables and mix them in a bowl along with the moong and fenugreek. 5. Sprinkle salt and pepper just before serving. Add a dash of lime, to taste. 6. A nutritious and crunchy salad is ready to be served as a snack or before a meal. 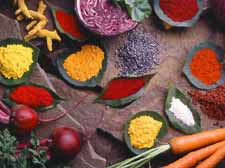 Play Holi with Natural Colours!! Holi!! !Just the name conjures up brilliant images of dazzling colour,fun,frolic and Masti!!!!!! But hold on-what happens the day after? ?You are left with itchy coloured skin,stained nails,red smarting eyes-.the list just goes on…..In fact at times people who are allergic to certain substances might find it difficult to breath or take almost a month to recover from the rashes..This is caused by the chemicals mixed in the colours,which may contain heavy metals like chromium,lead,and mercury.Most Holi colors sold in the market are oxidized metals or industrial dyes mixed with engine oil. Sample this: Green &blue come from copper sulphate, purple is chromium iodide, silver is aluminum bromide, black is lead oxide and shiny colors are result of powdered glass being added to the colors. Asbetos and silica normally form the base for these colors.It is very hard to remove these chemical colors from the skin as they enter into the body through the skin.Sometimes these colours accidentally enter into eyes and can cause reddening and itching. 2.Use only branded natural colors which are now available in most stores. 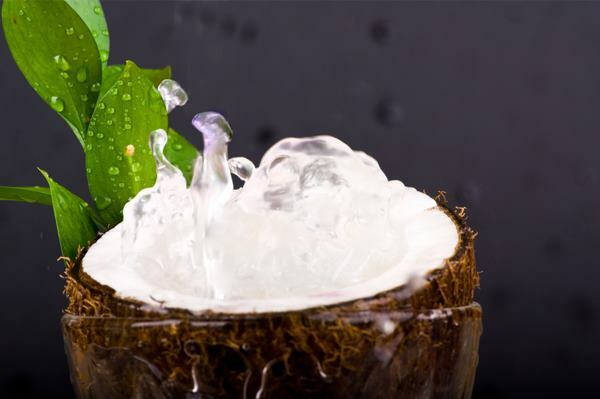 4.Apply coconut oil or aloe vera gel to your skin and hair,before playing Holi. 7.The Lemon Rub:Rub some lemon wedges over your skin for some time and then wash it off.Lemons can naturally bleach the skin&take off stubborn stains.After washing it off,be sure to apply a herbal moisturiser or aloe vera gel to prevent the skin from drying up. 8.Protect your hair: Oil your hair with a nourishing herbal hair oil or olive oil and tie it up before you step out.Later rinse off the colours with a gentle herbal shampoo&deep condition it with a jojoba based conditioner. 9.Apply a hair pack of coconut&fenugreek :This reduces the dryness caused by the harsh colours.Read more at https://prakritiherbals.wordpress.com/2012/02/23/go-coco-nuttya-coconut-fenugreek-hairmask-to-reduce-hairfalland-dandruff/ Make these natural colours at home…..All you need is some time and patience and you can!!!!! Wet Yellow Colour: Mix Two spoons of turmeric in two litres of water and stir well. 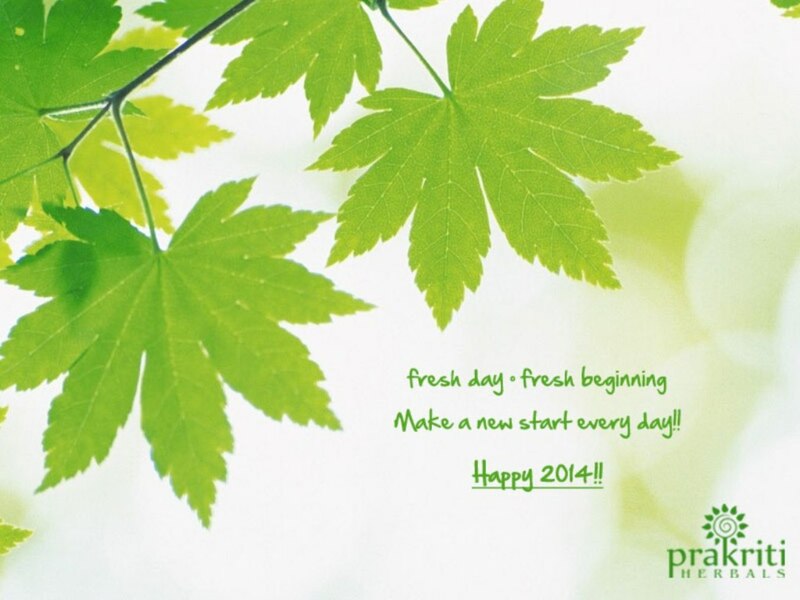 Dry Green Colour: Make a paste out of different leaves like spinach, coriander, mint etc in water and leave it to dry. Another method is to mix mehndi and any flour. Wet Green Colour: Take four spoons of henna and mix in two litres of water. Wet Magenta Colour: Grate beetroot and soak in one liter water for magenta colour. Wet Black Colour– Boil dried fruits of Amla / Indian Gooseberry in an iron vessel and leave it overnight. Dilute with water and use. 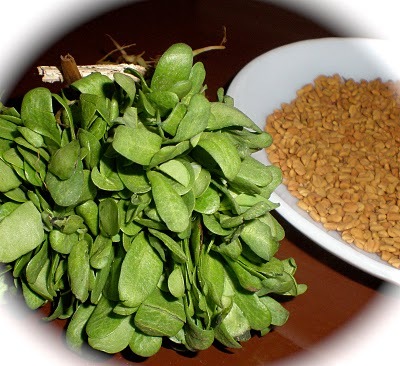 Fenugreek-Nature’s Boon For All Round Health!! Fenugreek is truly Nature’s boon to mankind and has always been a part of my childhood days,my motherhood,and my beauty care and health care routine for my family as well…I remember when we were kids,whenever someone had an upset stomach or a stomach ache,the first thing our elders used to give us was a spoonful of powdered ajowain,jeera and methi seeds,and the pain would just go away.Have you experienced this yourself??? Rich in protein,Vitamin C,Calcium,Phosphorus and Iron in their natural forms, Fenugreek seeds and leaves have high mineral and vitamin content which are easily absorbed by our body. 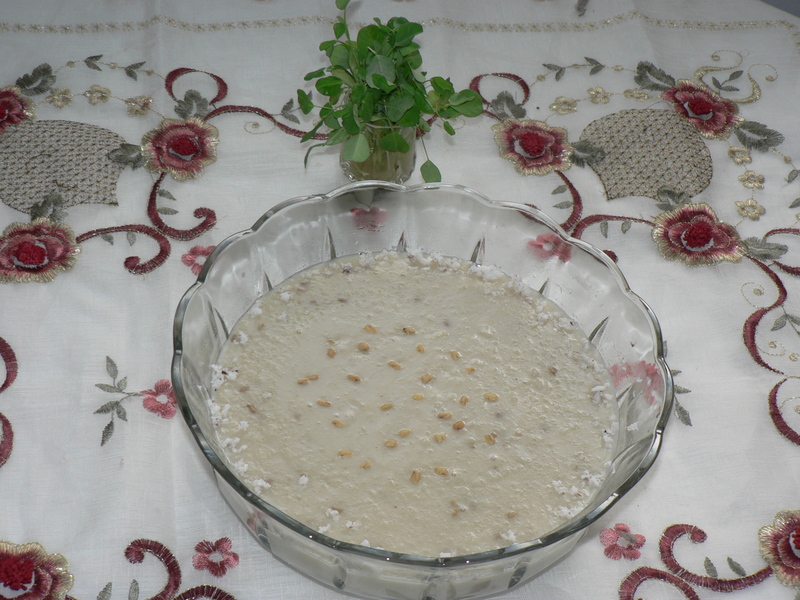 The oblong,flattened,brownish seeds have a slightly bitter taste,are roasted and ground, then used to flavour curries.The fresh leaves have a strong smell and they are extensively used,either fresh or dried,in Arabian countries,Turkey and India. Both the leaves and seeds of this slightly bitter-tasting vegetable are widely used in traditional Indian cooking;the seeds are generally used as a condiment and for flavouring.Fenugreek when taken regularly not only reduces cholesterol and blood sugar levels,but is also used for the treatment of various ailments like heartburn,diarrhoea,fevers etc.Thus fenugreek not only has exceptional medicinal uses,but can be used as a beauty aid as well. 2.Reduces cholesterol levels:Soak fenugreek seeds in water overnight.Strain and drink the water,first thing in the morning.Research has shown that the regular long-term use of methi seeds reduces deposits of fat in the body and lowers cholesterol. Fenugreek contains large amounts of mucilage which coats the stomach and intestine lining and reduces heartburn and ulcers. One teaspoon of fenugreek seed powder can be sprinkled on your food or swallowed with water before having your meal to minimize heartburn. Fenugreek seeds help in reducing fever. You can add two teaspoon of fenugreek powder in a herbal tea of your choice along with half a teaspoon of honey and lemon juice,or just have fenugreek herbal tea mixed with lemon and honey. 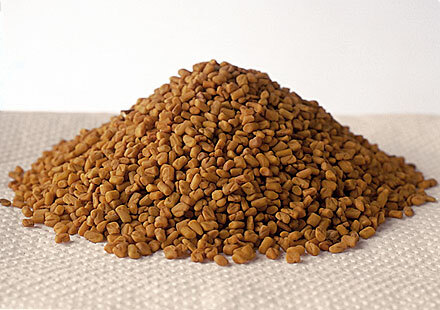 Fenugreek seeds are traditionally used to enhance milk production in lactating mothers especially in India.Studies have indicated that the production of milk can increase by up to 500% within 1-3 days of consuming fenugreek seeds regularly as it contains Diosgenin -a compound having estrogen like properties. Even today a yummy fenugreek based sweet is a must for lactating mothers in South India!!! Methi seeds which are rich in iron and vitamins,are nourishing and rejuvenating.If you experience fatigue or are troubled by backache and other body aches, just eat a teaspoon of methi seeds daily or include lots of fenugreek leaves in your diet. A lukewarm decoction of methi seeds if taken with honey is beneficial in cough and helps relieve sore throat, throat pain and tonsillitis. A teaspoon of methi seeds powder if taken with water is highly beneficial in treating dysentery,diaorrhea and urinary infections. 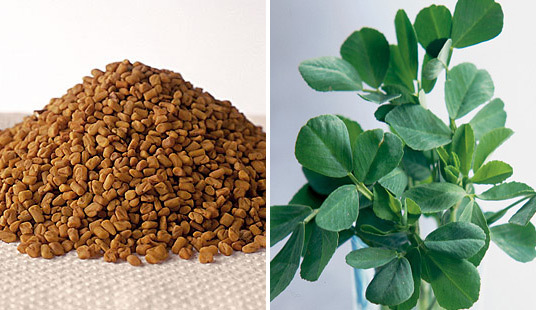 Fenugreek contains Lecithin which is an important nutrient for the brain and helps in increasing memory power. Fenugreek(methi) seeds reduce hair fall,dandruff and hair thinning and makes hair silky smooth.They replenish hair growth as they are a good source of protein&amino acids.Many scientists have confirmed that fenugreek contains a large amount of lecithin which is a natural emollient and makes hair smooth,healthy and strong.It also tones the hair,making it silky and shiny. With its innumerable benefits,sure makes a lot of sense to adopt this nature’s boon in our daily diet &reap all its benefits!! !Do share your stories about how fenugreek has contributed to your life as well!! If you have been to Kerala,you will notice that the older women have lovely luxurious black hair…..The secret of their lovely locks is the natural products that they use for their hair.They regularly apply coconut milk,coconut oil to their hair&wash it off with ritha and shikakai based natural shampoos. Make a paste of 1 teaspoon of powdered fenugreek seeds and 3/4 cup unsweetened coconut milk extracted from coconuts.Apply this paste to the scalp,cover with a hot towel or showercap for 30 mins ,and wash off with a herbal shampoo.Condition with a jojoba conditioner.Repeat twice a week for 2 months and check out the hair growth for yourself!! Fenugreek seeds replenish hair growth and are a good source of nicotinic acid,lecithin and protein and also moisturizes hair and reduces dandruff.Coconut milk nourishes the scalp and has been proven time and again to promote hair growth. So what are you waiting for? ?Make this age old priceless recipe your own,and a part of your weekly haircare routine to resolve all your hair problems!!! 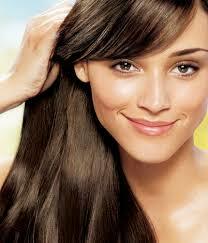 Reduce Hair fall and dryness of hair with natural remedies!! It is widely known that lovely healthy hair is our crowning glory and can totally transform your looks.But sadly today loss of hair is the bane and fear of almost everyone’s lives and a big source of stress itself!! I’m sure you would be glad to know that the hair that you lose each day was just bound to be shed and only signifies the growth of a new hair….. just like you lose your milk teeth and get new ones when you were kids……:) So stop stressing over the hair in your hairbrush,unless of course it crosses 100 strands/day or falls out in clumps or leaves bald patches behind,you don’t have to worry too much! !Of course it doesn’t hurt to take care of whatever precious hair we do have, before it starts to disappear,right??? 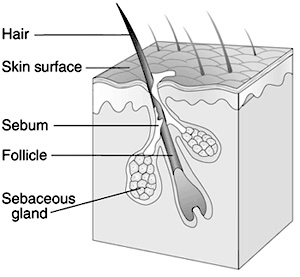 So for starters, let’s first understand the structure of hair and get to the root of the problem of hair loss!! 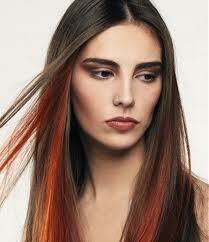 Hair is composed mainly of the protein keratin filaments and grows from follicles in our skin. The base of the root is called the bulb or the papilla, this is from where the hair that we see actually grows.Our hair actually grows amazingly fast- approximately at the rate of 1/2 inch per month.Hair grows approximately at the rate of 1/2 inch per month.The active growing phase of our hair is called the anagen phase,and then it passes into a transitional state or the catagen phase and telogen phase where it rests for a 100 days and then falls out. Thus a Hair loss of 50-100 strands/day and even upto 100 strands /day is considered absolutely normal.It’s only when it crosses 100 strands/day ,suddenly starts falling out in clumps or leaves bald patches behind ,that it is considered to be the condition called Alopecia or Hairloss. 3.Hormonal imbalances in women during adolescence ,pregnancy or menopause. 4.Hormonal imbalances in men-Male pattern baldness(Alopecia areata) is sometimes caused by a hormone called DHT(Dihydrotestosterone) which shrinks and eventually kills the hair follicles causing bald patches.An enzyme called 5-alpha-reductase converts testosterone into DHT which causes hairloss. Sadly we only wake up when these conditions get really bad,and then shortcut chemical solutions only end up causing more harm than good.I’m sure all our grandmoms have much much better hair than us& that’s only because they would have followed the age old herbal traditions of haircare,healthy diets and preventive care..So isn’t it time we got back to nature &its natural solutions for restoring health&shine and reducing the very much prevalent problem of hair loss which now plague men and women alike!! 1..Eat right&Nourish your hair from inside out.……. 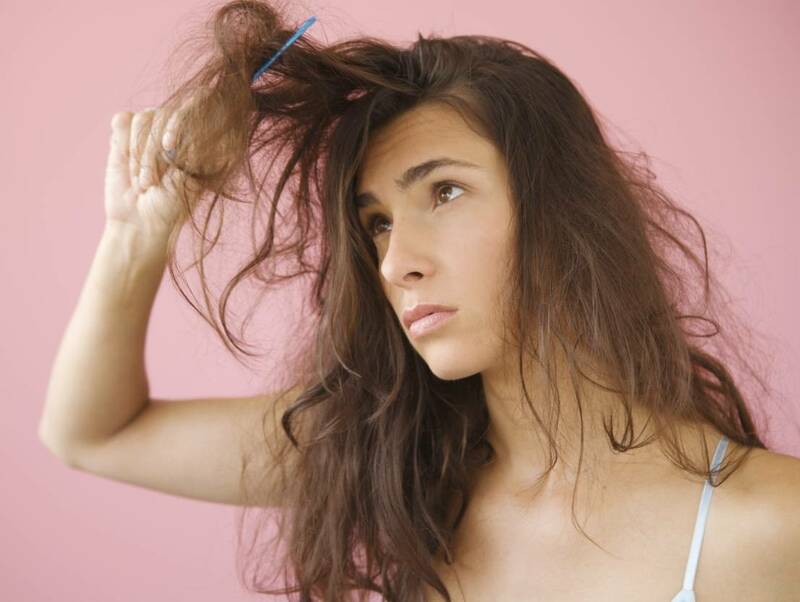 Hairfall,and dry frizzy hair are more often caused due to deficiencies of Proteins and Omega 3 fatty acids in the diet. 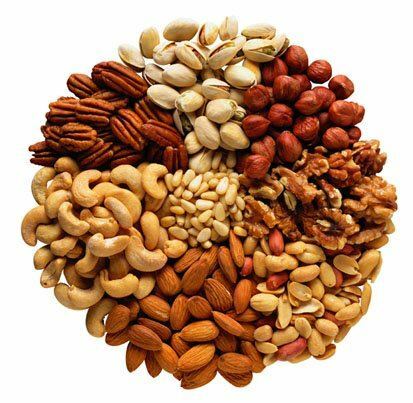 The first step in tackling these problems would be to increase protein and omega 3 fatty acids uptake in your diet-especially from eggs,nuts like walnuts,almonds,flaxseeds ,pumpkin seeds,cashewnuts,groundnuts ,soyabeans,olives,legumes, and lots of fruits&veggies….you have to nourish it from inside out as well!! Good hair nutrition begins with getting enough protein, which is the building block of your hair which is composed of 70 percent keratin protein.Egg whites contain a large amount of protein–ranging from 3.6 to 6.5 g per egg–and help rebuild damaged hair by filling in weakened spots along the hair strand, which strengthens the hair.They are also rich in several minerals, including zinc,selenium, iron,potassium and sodium, esential amino acids vitamins like choline which regulates hormones,as well as Vit E,Vitamins from the B family and Vit D which are all essential for healthy hair. Walnuts are an excellent source of vitamin E,and omega 3 fatty acids strengthen the hair and keep it well protected from dryness .Munch just 7 walnuts a day and you will have met the recommended levels of minerals, vitamins, and protein.Drink lots of water as well as deficiency of water can cause dryness and frizziness due to lack of moisture in the hair. 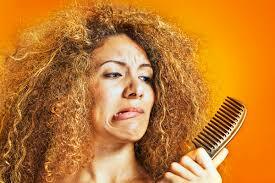 Deficiency of Zinc ,Selenium and Iron have been found to cause hairloss in both men and women . Zinc inhibits the production of an enzyme called 5-alpha-reductase which converts testosterone into DHT,which is responsible for baldness especially in men.Zinc and selenium is found in high concentrations in most protein-rich foods,seafood and eggs. If you are a vegetarian, you will most probably intake less zinc that those who have meat-based diets. Vegeterian sources of Zinc are dairy products such as milk and cheese, yeast, peanuts, beans, and wholegrain cereals, brown rice, whole wheat bread, potato and yogurt. Of all these, pumpkin seeds offer one of the most concentrated non-meat food sources of zinc. 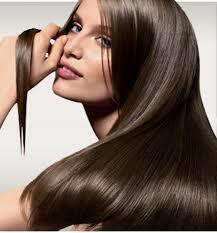 they are both very high in iron content which reduce anaemia thus reducing hair fall as well. According to Ayurveda ,excessive heat generated in the scalp(pittha)causes hair loss.Ayurveda recommends keeping the scalp moist and cool with oil massages of herbal hair oil made by infusing coconut oil or sesame oil with extracts of amla,brahmi,hibiscus and fenugreek which cool the system and scalp and encourage growth of hair. Pamper your hair with a herbal hair oil massage the right way:With 2-4 tsps of warmed hair oil,use 4 fingertips to start massaging at the base of the neck.Massage the scalp with circular and zigzag movements of the fingers gently.Cover the hair with a hot towel or showercap for 30 minutes,so that the body heat helps the herbal oil get absorbed better.Wash off with a mild herbal shampoo.Repeat twice a week for best results. 3.Go coco-nutty! !……A coconut-fenugreek hair mask to reduce hairfall,dandruff ,promote hair growth and nourish dry hair-Apply this hairmask twice a week for 2 months and check out the hair growth for yourself!! Fenugreek seeds replenish hair growth and are a good source of nicotinic acid,lecithin and protein and also moisturizes hair and reduces dandruff.Coconut milk nourishes the scalp and has been proven to promote hair growth. 4. Apple Cider Vinegar rinse reduces dryness and frizziness of hair,as well as hairloss:It acts by removing deposits of minerals from hard water and residue styling products on the hair strands.Use as a final rinse after shampooing with a herbal shampoo and conditioning with a jojoba based conditioner.You could either spray it as a final rinse,or pour it over your hair bending over a sink.Towel dry,and your hair will be softer and shinier. 6. Aromatherapy is recommended for reducing hair loss and conditioning the hair.Essential oils promote hair growth by improving circulation to the scalp, cleanse and nourish the hair follicles. Mix 1 tbsp of jojoba oil,3 drops of rosemary oil,3 drops of lavender oil,3 drops of lemon oil with a wooden or plastic spoon and massage well into the hair roots.Wash hair using a herbal shampoo and condition with a jojoba conditioner. Rinse well. 7. Drinking 2-3 cups of green tea reduces hair loss as well,especially by inhibiting the action of DHT which causes baldness,especially in males.Male pattern baldness is caused by the action of a hormone called dihydrotestosterone (DHT) which kills hair follicles and causes baldness.Green Tea inhibits the production of 5-alpha reductase,which converts testosterone into DHT. 8.Nourishing and conditioning egg and olive oil or herbal hair oil hairmask .Use a jojoba conditioner or a protein based conditioner to tame dry and frizzy hair. Method:Take 2 eggs in a medium-sized bowl, beat eggs with a whisk. Add 4 tbsp of extra virgin olive oil or herbal hairoil and continue to whisk until foamy. Apply entire contents of bowl to your scalp and hair and massage well. Cover the head with a shower cap and leave for 30 minutes at least. 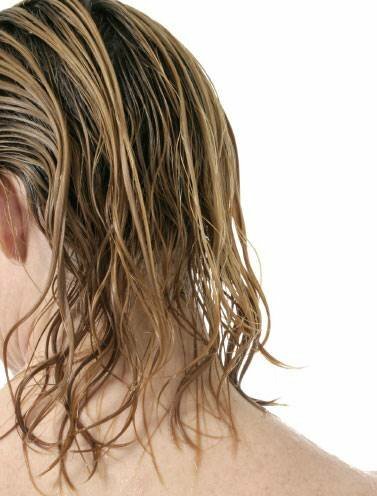 Wash hair using a herbal shampoo and lukewarm water. Rinse well. Truly following all these natural tips,to make your own natural green hair remedies not only protects your health,saves you money and supports the planet – three great reasons for giving these natural hair treatments a try!Feel free to add your feedback on these natural treatments ,and your own time tested tips of course!! !